When deciding to outsource any particular process that is essential to your company’s success, including transportation, there are risks and benefits to weigh. Before making such an impactful business decision, it’s important to understand the variety of costs and risks associated with continuing forward with internal transportation management or hiring a third party freight services company. That being said, hiring a freight services company can offer a significant return on investment (ROI), especially if your company is currently spending thousands in freight spend and still executing transportation and logistics using manual processes (spreadsheets, faxes, phone calls, etc). By working with a 3PL for your transportation management services, there is typically 4 to 15 percent reduction in freight spend due to a variety of factors.In fact, it is very rare that shippers don’t receive substantial savings in freight cost when employing an external provider of freight services, according to ARC Advisory Group. The best part of all is, these savings are achieved without sacrificing any quality in customer service or production — in fact, these areas are normally improved with the help of a freight services company partnership. This allows your company to stay competitive and support long-term, sustainable growth. The following are some more specific ways that your business can benefit from utilizing transportation management services. Finding local carriers for your freight can be a time-consuming process. By partnering with a freight brokerage company like Trophy Transportation, you have access to the best local freight experts, no matter where in the country you need freight services. This means that you are guaranteed a quality contact for delivering your freight from anywhere in the country, as we only work with the best of the best. Our customers benefit most from our freight brokerage services when they find themselves in tight situations, such as needing freight or heavy equipment to get across state lines by a certain time. By having a reliable freight network of local transporters, we can get you the right person for your specific needs every time. By utilizing a team that has been around the block when it comes to freight services for over a decade, you open up a new realm of opportunity to improve your company’s delivery capabilities. By using a transportation management company, you will be less in the weeds, meaning you can focus on improving your process of preparing freight for shipment more efficiently, then leave the rest up to us. You can also lean on the expertise of your freight services partner for creating more optimal shipping strategies, like pool point distribution. When you are able to be more confident in your transportation management, you can start making more strategic business operations decisions. With your freight being delivered properly on a consistent basis, you will have less sitting inventory in your warehouse, meaning more capital to put toward expanding your production capabilities. While we briefly touched on the increased customer service levels brought about when hiring a third party freight brokerage company, we can’t stress this benefit enough, as it’s such a key differentiator for remaining competitive today. When it comes to business, we all know that it’s easy to gain a customer, but hard to keep a loyal one. With the help of a freight services team, you can ensure you are not only continuing to provide timely shipments to your customers, but also improving upon your processes — no more issues with freight claims or improver invoices, making their experience working with your company better and better. 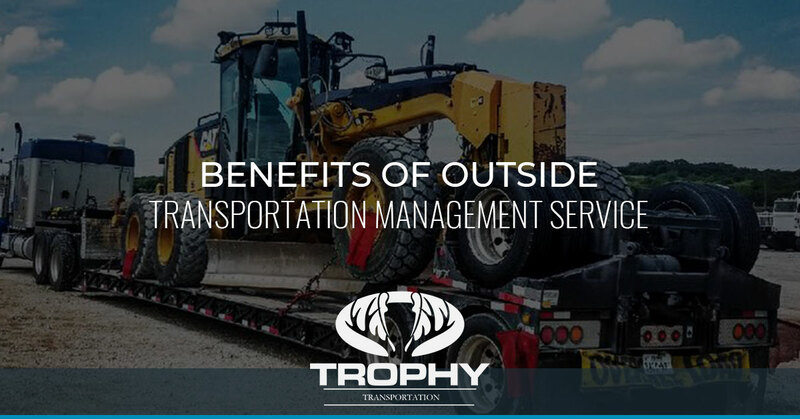 These are just a few manners in which your business can benefit from streamlining your transportation management with a freight brokerage company like Trophy Transportation. If you’d like to learn more about the freight services we have to offer, reach out to our team today.